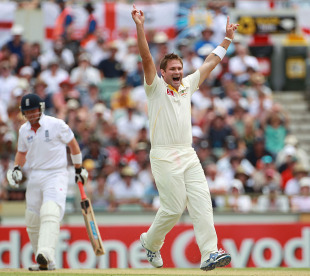 A week before the Ashes series Ryan Harris didn't expect his body would let him play, but after two brave performances he will start the Boxing Day Test as a vital cog in Australia's suddenly purring attack. Harris will always bowl with pain in his right knee, which has minimal cartilage on the outside of the joint, but he gained the perfect anaesthetic at the WACA with a second-innings haul of 6 for 47. "It's pretty special," Harris said in Perth. "Leading into the series I was hoping to take part, but obviously with my knee the way it was I wasn't sure if I was going to be a part of any cricket this summer. At the moment it's a great feeling, to level the series and get back to 1-1, and to take six wickets in an Ashes Test. I'm feeling pretty good at the moment." His knee is now in such decent shape that when he meets his surgeon David Young, who has operated on him a couple of times this year, in Melbourne this week it will be mainly to have a chat. Twice this summer he has had to have fluid taken out of the joint as a result of the constant bone-on-bone collision, but he doesn't think it will be necessary this time. While the prognosis is good in the short-term, Harris, 31, is unlikely to have a long career because of the severe wear and tear. That won't be a major concern if he leaves the game with a come-from-behind Ashes victory on his resume. If he was 10 years younger he could have a cartilage transplant, but the recovery would take up to 18 months and would end his playing days, so it is not an option. Whenever Harris has watched previous Boxing Day Tests he has felt shivers down his spine and he is expecting more tingles when the game begins on Sunday. "The thought of it actually gets you nervous," he said. "It's going to be an amazing feeling - if I'm picked. I got a text before from my surgeon and he said: '100,000 people at the MCG, you're going to enjoy it.' He got me thinking that it's going to be a great feeling, especially now with the series 1-1." Harris and Shane Watson are the most improved Australian players over the past two years, with Harris rising from a capable domestic performer to a damaging international fast bowler. He used to have a bustling run-up but now he sprints his large, strong frame to the wicket, delivering at around 145kph and swinging the ball. While his knee was too great a risk to figure in Brisbane, he has been the side's most consistent bowler over the past two Tests, which is even more satisfying because he's played only four matches in a baggy green. Harris has a croaky voice and it became coarser after his roaring appeals at the WACA. There was plenty for him to shout about during the second innings. He claimed four wickets on the final morning, including the lbw of the in-form Ian Bell, as he took his tally for the match to nine, the same as Mitchell Johnson. He also removed Bell in the first innings to follow the wickets of Andrew Strauss and Graeme Swann in a comprehensive display. Despite achieving such success in the most important match of his career, Harris revealed he wasn't pleased with the way he performed on the final morning. "The feeling I had wasn't great," he said. "The positive out of that is that I've taken six wickets." The understated Harris is a perfectionist and Ricky Ponting has been working on trying to settle him over the past year. "He is very hard on himself and he never feels like he's bowling well or has bowled a good ball," Ponting said. "My challenge has been to relax him into it and not let his mind get in the way." Harris agreed that he can get down on himself easily. "Coming here [to Perth] and it having a bit more bounce I was thinking about what I had to do and I was trying to bowl that perfect ball," he said. "The best thing I can do is not think about it and just go out and bowl and do what I do best, which is bash the wicket. They always say that fast bowlers aren't smart blokes so I probably shouldn't think as much as I do." The Australians are on top after their WACA win changed the complexion of the series. Some of the players celebrated by humming along to U2's Elevation at a concert in Perth hours after singing their victory song for the first time since July, but in the most recent Ashes series the team on a high wasn't guaranteed to stay there. "We've crushed them pretty well here after being crushed in Adelaide," Harris said. "It's a new Test [in Melbourne]. They'll go away and work pretty hard during the week, but I do think we've got an edge over them a bit going into that big Test."